My friend Sara, owner of Thrive Nutrition & Yoga, is a nutritionist, food activist and incredible mom, among other things. I love learning from her. Every time I see her, she inspires me to cook more, cook better, and look at ingredients differently. The last time we had lunch together, we had a picnic, and as usual, I openly scrutinized everything she brought and asked a million questions. We discussed the bread she was using (gluten-free, Grindstone Bakery, toasted) for her sandwich, where she got her incredible plums (farmer's market), and these intriguing truffle-shaped desserts she brought to share (Three-Stone Hearth). The truffle-shaped desserts were date balls that had been fancied-up. They were delicious, and I decided I'd have to attempt to come up with a similar recipe. The idea to re-create these little treats also fit nicely with Sara's and my ongoing discussion about concocting homemade snack bars, like Larabars. It seemed to me that you could make a recipe like this into whatever shape you desired. 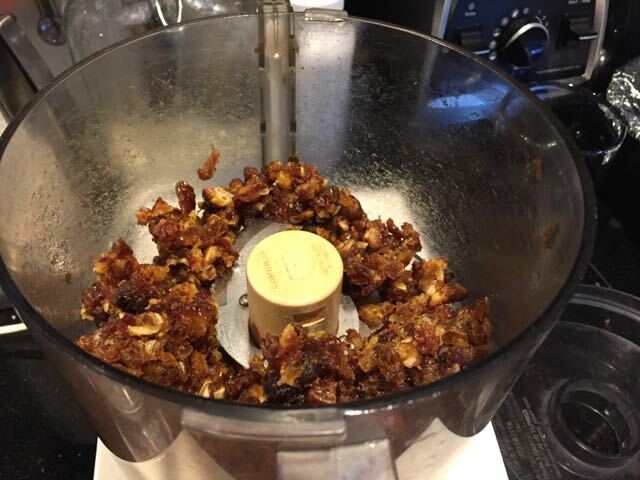 I finally got around to working on a recipe for date treats last night, and they're great. We like them so much I don't know what I would change. *Notes: If you can't eat coconut or can't find coconut butter, I bet you could easily substitute 2-3 tablespoons of a seed butter and omit the coconut flakes. I currently get my sprouted sunflower and pumpkin seeds at Costco. I like using sprouted seeds when I can. The seeds I use are lightly salted, which helps this recipe taste good. If you use seeds that are unsalted, you'll probably want to add a pinch or two of salt to this recipe. 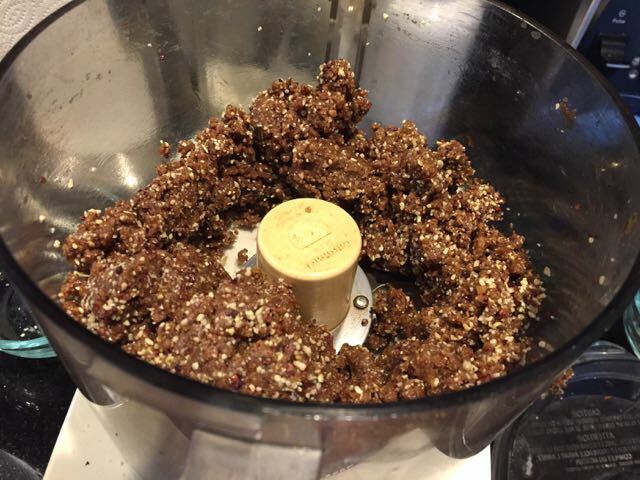 Put the dates in the bowl of a food processor with the s-shaped blade, and process the dates so they are coarsely chopped. 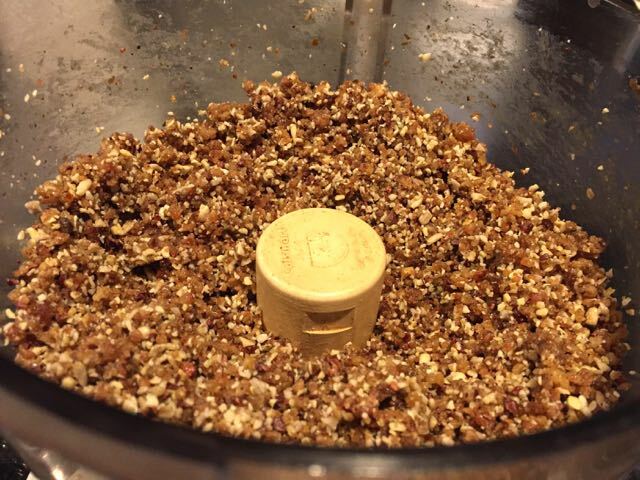 Add the seeds and cacao nibs and process until everything looks pretty well chopped-up. Add the vanilla and 3 tablespoons of the coconut butter and let the machine run until the "dough" starts to look as if it is coming together. If it looks like it's a little dry and when you pinch some between your fingers, it seems crumbly, add another tablespoon of the coconut butter and run the machine again until the "dough" holds together. Take a cookie scoop (or your fingers) and scoop up enough "dough" to make a ball that's about an inch in diameter. 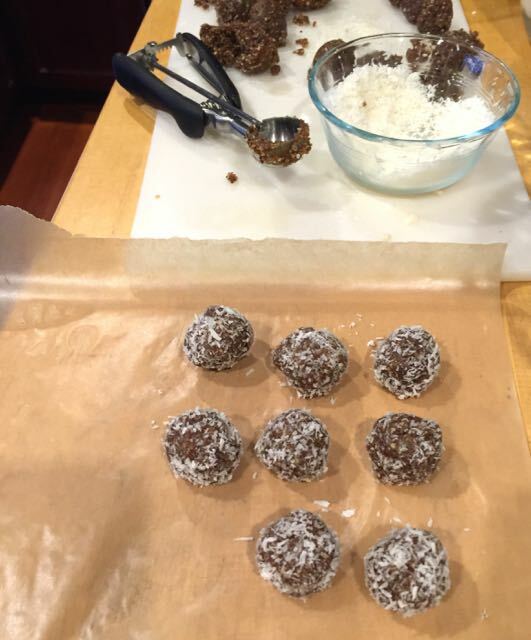 Roll the ball a bit to make it spherical and then roll it in the shredded coconut. Place the balls in layers, separated by waxed paper (just to avoid them mushing together) in a storage container. Put the container in the refrigerator if you want the treats to be firm, or you can leave them at room temperature and they will be softer. For me, this recipe made about 3 dozen treats.